Tomorrow I am going on an Adventure! I’m so excited about the Adventure that I bought new shoes, which I decided to test by going for a walk today. I pulled into Ashville Park barely thirty minutes in front of a line of rain, so I didn’t have time to walk very far. I had enough time, though, to find the resident pair of domestic geese. These geese were featured in our local newspaper in 2010, “Sit back and enjoy the tale of Jack, the lonely goose,” and I’m happy they are still thriving. Further down the road, I spotted an unfamiliar silhouette on a long, narrow pond. Before I got close enough to try for a photo, a sparrow began sounding an alarm and the slender diving bird disappeared. I waited a while, but the mysterious diver never returned. While I was photographing the sparrow (I believe this is a Song Sparrow), I spotted some unusual activity in a nearby stand of trees. 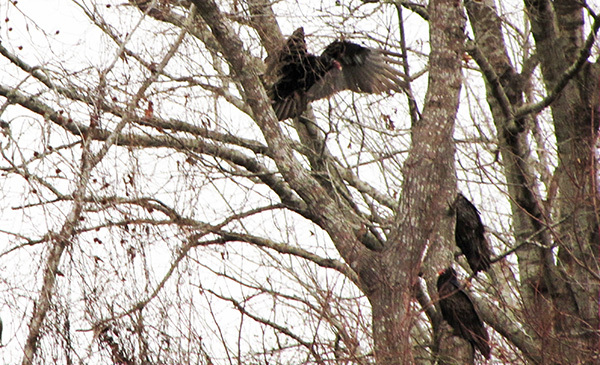 Several vultures were resting together, at least five, and two more joined the group while I watched. More vultures were circling in as the rain arrived and chased me back to my car. My camera got a bit wet, as did my new shoes, but both have already dried and are waiting by the door for tomorrow’s Adventure. I may not be able to sleep tonight! Yes, that looks like a Song Sparrow, and I think that’s a Black Vulture. My field guide says that immature Turkey Vultures retain their juvenal plumage from July to November, so all your Turkey Vultures should have red heads now. I never thought to check how long it takes them to molt into adult plumage! Thanks! ace where their brood could have a chance at flying away and living their own lives. Alas, age and experience have not trumped habit.